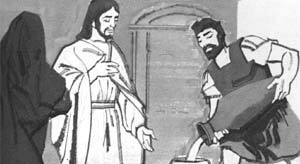 esus worked his first miracle at a wedding in a village called Cana. Jesus, His Holy Mother and His disciples were invited to the wedding. Now in those days it was a custom to always serve wine at a wedding. Normally the best wine would be served first and then afterwards the lesser one. But at the wedding where Our Lord was the wine ran out. Our Lady then came to Jesus and told him, “They have no more wine.” Now for the marriage couple it was an embarrassing thing to happen. But Jesus had pity on them. So the servants took a cup-full to the chief steward and they were amazed. The water had been changed into wine! Fill in the missing word for the meditation on the Rosary ! !